No Evil Foods is a mission-driven business near Asheville, NC focused on impacting environmental sustainability, public health, and animal welfare through better food choices. Every bite of No Evil Foods supports our cause: to use food as a force for good because real change starts at the center of your plate. No Evil Foods product line includes Comrade Cluck ‘No Chicken’, The Stallion ‘Italian Sausage’, El Zapatista ‘Chorizo’, and Pit Boss ‘Pulled ‘Pork’ BBQ,’ all are low in fat, high in protein, and free from cholesterol, nitrates, and antibiotics. No Evil Foods started in 2014 and is available in retailers nationwide including Whole Foods, Earth Fare, Wegmans, Fresh Market, and in co-ops, independent grocers and restaurants. How they launched the company with $5,000 investment from their own savings in 2014. Their first experience selling products at a local farmer’s market. How their products differ from other plant meats in the market and their ingredient philosophy. The brand’s early inspirations and punk rock/DIY ethos. How they evolved into a real food business, and the lessons learned along the way. Experience with fundraising and growth and dealing with investors and retailers who didn’t understand the brand and their products. Their thoughts on keeping it real using their brand as a platform for causes they are passionate about. 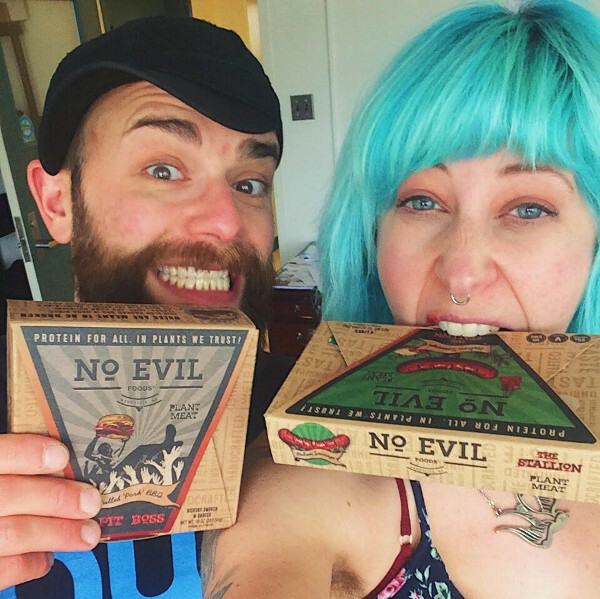 No Evil’s mission and how it influences their products, packaging and how they run the company. What kind of impact do they hope to have with their brand, products, and message.